Wash and soak the rice, dal/lentils and methi seeds in water over night. Wash and soak the flaked rice in minimum amount of water for 30 minutes before making the paste. Take out the additional water from all the ingredients and reserve the water for later use. Make a smooth paste with rice, lentils, flaked rice and methi seeds in a blender. Add small amount of reserved water if needed. Don’t make a thin paste. Transfer the paste in a large bowl. Add salt to the mixture, cover the bowl and let the mixture ferment for at least 6 – 8 hours. 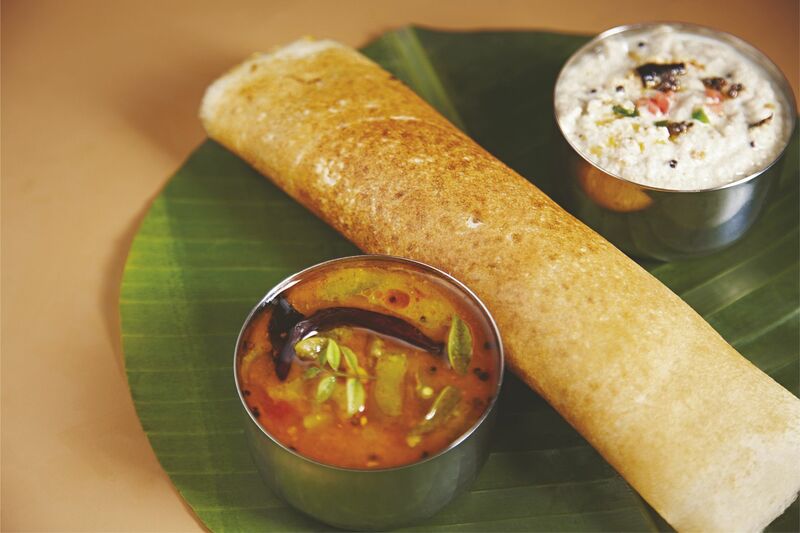 Recommended: Fermenting batter for 8 hours to get a soft and crispy dosa. After the fermentation, mix the batter very well, add water if it is too thick. The batter should be in pouring consistency. While the batter is fermenting lets prepare other supplementary. To get the tamarind pulp, take some warm water and soak the tamarind in it for 30 minutes. Once the tamarind gets soft, then squeeze the tamarind and remove the pulp. Strain it later. Wash the mung dal and chana dal with water. Pressure cook them up to 4 whistles or until they are mushy. Then mash them completely with a mixer or blender. Heat oil in a large pan over medium flame. Add kali miri and let it splutter. Then add onion and fry until translucent. Add other vegetables and fry till they get mostly cooked. Now add tomato, adrak paste, chilli paste, salt, haldi powder, grated coconut and curry leaves. Cook for another few minutes and then pour the mashed dal into the vegetable mixture. Add water to make the sambhar at your desired consistency. Add sugar (optional), sambhar garam masala and tamarind pulp to it. Let it boil for few minutes. Now sambhar is ready to serve. Roughly mash the boiled potato by hand. Heat oil in a frying pan over medium flame. Add kali miri to splutter. Add onion and fry till it gets translucent. Add adrak paste and sauté it for a while. Now add the mashed potato onto it. Add salt, haldi, jeera & dhaniya powder, hari mirchi, green peas and kadi patta into it. Mix them very well and fry for few minutes so that the flavour of these ingredients incorporates in the potato. Turn the gas off and add the dhaniya leaves (optional). Grind the grated coconut, adrak, harimirch and dhaniya leaves along with yogurt, salt and sugar to make a smooth paste. Heat oil in a small pan, add kali miri and red chillies into it. Let the kali miri splutter and then add kadipatta. Stir for a while and put the gas off. Now tamper the coconut paste with this mixture. Put the tawa over very low flame. For making dosa you need your tawa to be just warm, not hot. That’s why after making each dosa wipe the tawa with wet cloth to bring its temperature down. Take the batter in a big ladle and pour at the centre of warm tawa. Spread the batter from the center to edges by making small circular motions by the bottom of the ladle. Now sprinkle little amount of oil around the edge of the dosa and cook it for few minutes. Oil gives the dosa golden brown color although it is optional. Dosa is cooked by only one side. As it gets cooked put the filling i.e. the potato mixture at the center of the dosa and fold it from both sides. Always take rice and lentils in 3:1 proportion. Flaked rice makes dosa soft. Give the dosa batter sufficient time to get fermented otherwise your dosa will not be quite crispy. Always bring down the temperature of the tawa otherwise it will be tough for you to make dosa.